The science behind smiling versus frowning does not lie. Not only does your face use fewer muscles to smile than it does to frown, but smiling, whether it’s forced or genuine, has been proven to make people happier and enhance their overall quality of life. We could probably write an encyclopedia-level book on a list of things that tend to objectively make people happy, but today, we’ll spare you some of that overly lengthy content. However, we will touch on some of the things that everyone seems to love – you know, things like puppies, cake, sunshine, and other things that are generally pretty unpopular not to like. One of those things has to be renting a beautiful Ford Mustang convertible on a nice, sunny beach day in Miami. At Miami Art Cars, we specialize in providing you with personalized, tailored luxury rental car solutions so that you can cruise around the city in the utmost style and class. Our fleet includes an array of gorgeous Mustang rentals clean and ready at your convenience, so the next time that you’re in the Miami area, stop by Miami Art Cars after flying in and discover the drop top convertible lifestyle that we know you’ll love. Feeling happy? Continue reading below about some of the ultimate things that make us happy. Not to get overly sentimental, but the things that make us happy don’t always have to be material or even tangible. Sometimes, a nice, well-thought-out compliment from a valued friend or family member is just what we need to turn a gloomy day into a bright, sunny Miami day. We’re not sure what you did differently this morning versus yesterday morning, but some days, our hair doesn’t seem to cooperate and other days it just works. Other than wearing a fresh pair of shoes and nice clothes, there’s no boost in confidence quite like a good hair day. Even if you have little to no hair to work with, flaunt what you got! Everyone deserves a great hair day. Most people seem to go through the whole waking up early on a Saturday thing, where you realize that, though your normal work alarms went off this morning, you have that immediate feeling of satisfaction that you can lay your head on the pillow without a care in the world for the next few hours – or even the whole day, because after all, you have the day off. You probably saw this one coming, but until you’ve experienced the coolness factor of cruising around in a Mustang with the top down, you’ll never know the true significance of the Mustang rental. A Mustang rental blends the affordability of sub-standard compact rental with the classic style and elegance of…well, a Ford Mustang, or any other nice car. The next time you’re visiting the Miami area, you should know who to get in touch with to get the rental you want. Contact Miami Art Cars to roll around in style and comfort! 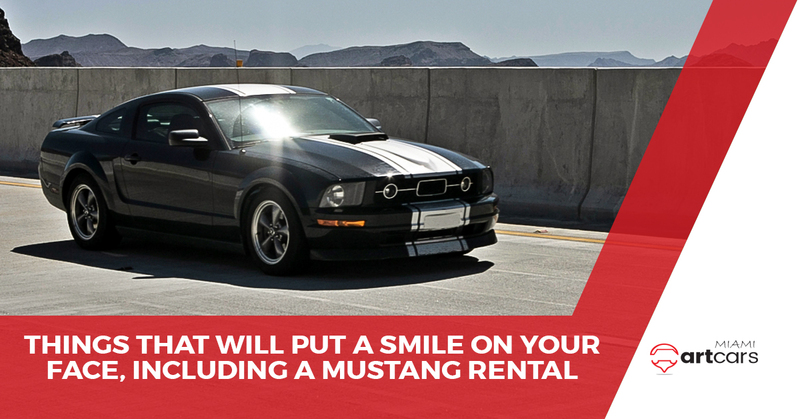 Get Your Mustang Rental Today!